Dan Drolsum of Castle Rock, Colo., sent in this shot of the Vanguard Cadets' drum line warming up prior to Drums Along the Rockies this past summer. "I marched with The Purple Knights of Rockford, Ill., during the 1960s. I was drum instructor to the Colt .45 of Dubuque, Iowa, from 1967 to 1973. I will never get drum corps out of my blood!" Drolsum said. Thanks! E-mail your Forzato submissions -- and we will get to them all, in time -- to dave@dci.org along with where and when the photo was taken. Send some biographical information about yourself as well. We'll give you full credit. 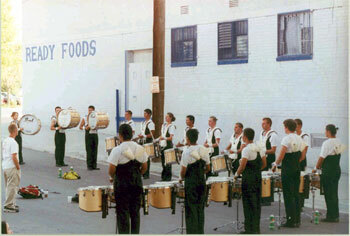 Also, let us know if you want your e-mail address included, to get feedback from other drum corps fans.